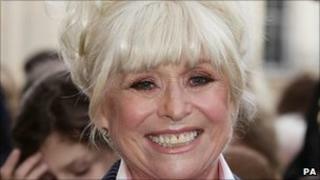 Veteran actress Barbara Windsor has been honoured for her outstanding contribution to showbusiness. The former Carry On star, who also played Peggy Mitchell in EastEnders for 16 years, received the prize at the Variety Club Showbiz Awards. ITV1 talent show X Factor won the best entertainment trophy, beating the BBC's Strictly Come Dancing. The ceremony, which was hosted by Justin Lee Collins, took place at London's Grosvenor House Hotel. There were also trophies for dance troupe Diversity, who found fame on Britain's Got Talent. They took home the inspirational young talent award ahead of Doctor Who star Matt Smith. The star-studded event also saw two generations of the same family collecting trophies when Ray Winstone won film actor of the year and his daughter Jaime collected the outstanding British film award for Made In Dagenham. Chart act N-Dubz won the recording artist of the year title, and Sheridan Smith was given the musical theatre award for her starring role in hit West End musical Legally Blonde. Singer Russell Watson, who is on the comeback trail after a life-threatening brain tumour, picked up the classical prize. The comedy prize went to the E4 series The Inbetweeners.